By Joe Viechnicki, KFSK — Southeast Alaska’s three-day heat wave appears to have run its course, but not before setting new all-time records for the month. The National Weather Service reports new all-time high temperatures for the month of March in Sitka and Petersburg, where the thermometer hit 62 degrees on Monday, March 18. Kimberly Vaughan is a forecaster with the National Weather Service in Juneau. In Petersburg, the previous high for March was 61 degrees set in 1994. Sitka’s previous high was 61 degrees in March of 1998. Sitka topped that record on Tuesday, hitting 67 degrees. 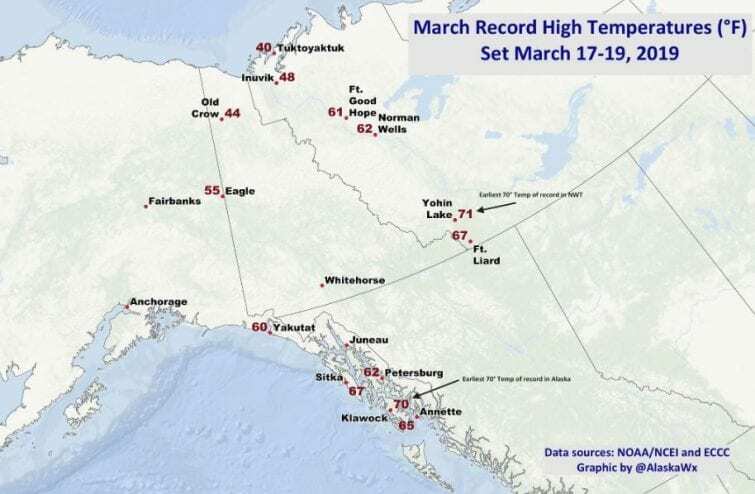 All-time high March temperatures were also set Tuesday in Ketchikan, hitting 65 degrees, Yakutat at 60 degrees, Juneau airport at 59 degrees and Haines at 56 degrees. And Klawock hit 70 degrees Tuesday, the first to hit the 70 degree mark this year. Wednesday began with the prospect of more records – until cloud cover rolled in, along with cooler air in the 50s, more typical of spring conditions which – incidentally – officially began with the Vernal Equinox at 5:58 p.m.